By 2008, the Pepe meme had been “widely adopted by users of 4chan and remixed ad infinitum from there.” His character and image, if not his name, were transformed. Anonymous online fans coloured his face green with brown lips and the laidback hedonism of the comic book Pepe was adapted “to fit different scenarios and emotions, such as melancholy, anger, and surprise”. In short, Furie lost control over the Pepe meme. For quite a while Furie remained faithful to Pepe’s hippy lifestyle. Accordingly, up until September 2016, he repeatedly professed indifference to bourgeois legal issues such as copyright and intellectual property. For example, when asked in an interview with The Atlantic whether he was upset by the ubiquitous use of the Pepe meme or the fact that people were “using him in different contexts,” Furie replied, “It’s never bothered me, in fact, “it’s been kind of inspiring to me.” But, the interviewer interjects, what “about the way it’s been adopted by the so-called alt-right”? Furie remains unruffled: “My feelings are pretty neutral, this isn’t the first time that Pepe has been used in a negative, weird context. … It’s just out of my control, what people are doing with it, and my thoughts on it, are more of amusement”. On a personal note: in September 2016, I had never heard of Matt Furie. 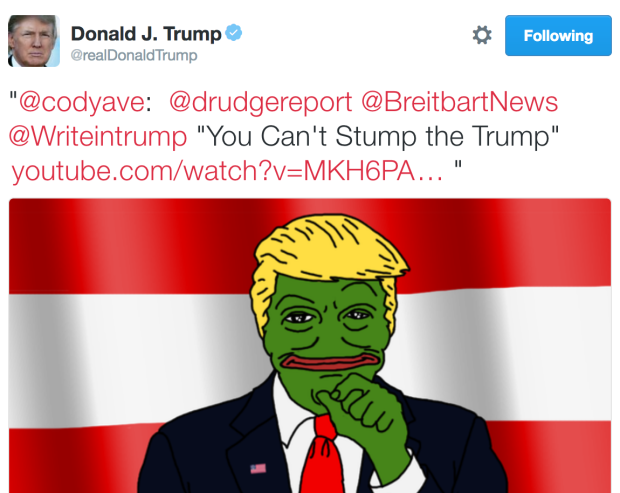 Pepe the Frog I knew only as the cyberspace mascot of the Alt-Right and the inspiration for countless Trump-Pepe memes starting with the one tweeted by the Donald himself back in October 2015. It just so happens that when Furie was being interviewed by The Atlantic I was thinking about cover art for a book to be published in late July 2017 by Arktos Media; namely, Dissident Dispatches: An Alt-Right Guide to Christian Theology. 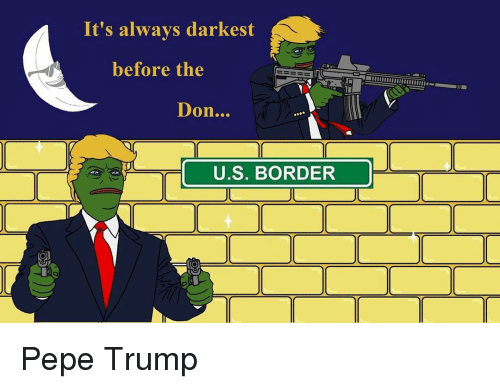 Looking for ideas, I came across a Trump meme in which an interesting rare Pepe appears in the upper right-hand corner. Bishop Pepe, as I came to know him, nicely encapsulated the core meaning, value, and purpose of my book, Dissident Dispatches. After all, the book arises out the culture shock experienced on all sides when a racially-conscious senior citizen sympathetic to the then embryonic Alt-Right becomes a mature-age student at a politically correct theological college in Sydney, Australia. There, my already bruised sense of Anglo-Saxon ethno-patriotism confronted a militant, multi-racial cult of the Other masquerading as progressive Christian theology. That experience convinced me that the postmodern secularism of Alt-Right ideology needs to reconnect with our spiritual roots in the golden age of European Christendom. I was no less sure that White Anglo-Saxon Protestant church-goers must learn how to anchor the transcendent truths of Christian theology in loyalty to an ancestral Angelcynn faith, family, and folk. 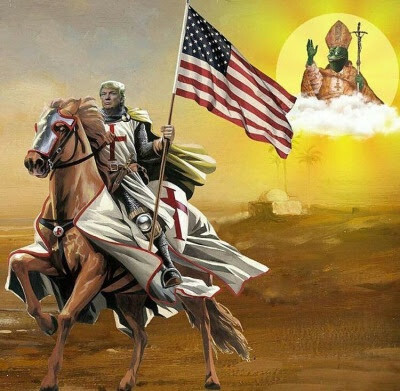 I recognized in Bishop Pepe a symbolic fusion of contemporary Alt-Right politics (via the Pepe meme) with the spiritual authority of the ancient Christian church (via an image of episcopal majesty). Unfortunately, Bishop Pepe as he first appeared to me had an uncomfortably reptilian look. However, an American friend well-endowed with computer skills agreed to remix the image into a friendlier frog. Arktos’ Andreas Nilsson refined him still further into the Bishop Pepe featured on the cover of Dissident Dispatches. Unfortunately, if Matt Furie, his lawyers, and the Anti-Defamation League have their way, Bishop Pepe will not be allowed to preside for much longer over the symbolic conversion of the Alt-Right to the faith of our fathers. Instead, our enemies want to kill Bishop Pepe, casting him back into the outer darkness from which he came to create order out of chaos. On October 17, 2017 Daniel Friberg, CEO of Arktos Media, received a letter from Wilmer Hale, a transnational law firm acting for Matt Furie. The letter identified Mr. Furie as “the sole and exclusive owner of all intellectual property rights—including U.S. copyright—in the Pepe the Frog character, image, and name.” Over the past month (unknown to me), similar letters have been sent to people on the Alt-Right such as Richard Spencer of altright.com and Baked Alaska, as well as to prominent Alt-Lite personality, Mike Cernovich. All the recipients are warned that they have breached Mr Furie’s copyright interest in Pepe the Frog. The letter to altright.com alleges copyright infringement insofar as Pepe the Frog has been used to promote “racist, alt-right, white supremacist, white nationalist, anti-Semitic, and neo-Nazi messages” on its website. Wilmer Hale asserts that it is “unauthorized and unacceptable” for altright.com to use “Pepe the Frog in connection with [its] promotion of hate.” Interestingly, one of the counts in Wilmer Hale’s indictment of altright.com arises from altright.com’s use of the Bishop Pepe cover image in its review of Dissident Dispatches on August 1, 2017. Bishop Pepe image from review of Dissident Dispatches on Altright.com. Arktos is held to be no less culpable; apparently, however, it infringed Matt Furie’s copyright in a much less comprehensive manner. Only “alt-right ideology and white supremacy” were promoted when the publisher dressed a frog meme as a bishop on the cover of Dissident Dispatches. The letter to Arktos demanded that they “cease and desist publicly displaying or selling any image of Pepe the Frog” in the “sale and promotion” of Dissident Dispatches. To that end, Wilmer Hale also sent a takedown notice to Amazon.com asking that company to take steps to end sale of the book. Almost immediately, Amazon.com complied with that demand. Accordingly, the book is no longer available on that platform (or even, so far as I can tell, on arktos.com). It is not immediately obvious why Matt Furie, almost overnight, abandoned his blasé attitude towards the “ubiquitous” use by others of the Pepe character, image, and name he claims to have created. Certainly, he cannot have much to gain financially by prying Pepe the Frog from the hands of a select few persons or enterprises associated with the Alt-Right. He does, however, have the support of more than one powerful organization. Wilmer Hale is acting pro bono on Furie’s behalf. “Google Play has stopped selling his Build the Wall: The Game for the same reason. It actually advertised special guest appearance from Pepe and had him popping up if you achieved certain things in the game,” [Louis] Tompros [an intellectual property attorney for Furie] said. Previously, Apple had refused to publish the game until it removed Pepe the Frog. Apple has a blanket ban against Pepe the frog that it has enforced against multiple app creators. In pursuing this legal action against the Alt-Right, Furie serves as a stalking horse for the ethno-political vendetta the ADL is waging against the Alt-Right. Not only does Furie have little to gain financially from killing off Bishop Pepe (or any other Alt-Right Pepe’s), the legal action itself is little more than an exercise in politically-motivated bullying. It is certainly not a good faith effort to vindicate genuine proprietary interests violated by me, Arktos, or any other Alt-Right actor. Even if, for the sake of argument, one concedes to Furie a copyright interest in Pepe the Frog, he has no right to absolute control over the use of that internet meme. The well-known legal doctrine of “fair use” provides a defence to a complaint alleging infringement of copyright. According to copyright lawyer Rich Stim, “a fair use is any copying of copyrighted material done for a limited and ‘transformative’ purpose, such as to comment upon, criticize, or parody a copyrighted work.” Any such “fair use” does not require permission from the copyright owner. The most important factor to consider in determining whether a particular use of a copyrighted work is fair has to do with the purpose and character of the use. “At issue,” according to Stim, “is whether the material has been used to create something new or merely copied verbatim into another work.” Not even Furie denies that his original monochrome stoner Pepe meme has been transformed beyond recognition in countless ways: first, by the anonymous legions of 4chan users and latterly by the Alt-Right. Bishop Pepe is but one example of the irrefutably radical transformation in the heedless hedonism that Furie associates with his feckless frog. Many journalists and copyright experts are “skeptical that a copyright suit over Pepe could hold up against a fair use defense.” A fair use expert at the Electronic Frontier Foundation, Mitch Stolz observes that Furie’s Pepe was “a crudely drawn character, and it doesn’t have a lot of defining characteristics. It doesn’t seem like it has a whole lot of personality.” Not surprisingly, therefore, people have been using that crudely drawn frog to mean whatever they want. And, as we have seen, before late last year, Furie did not have a problem with that. 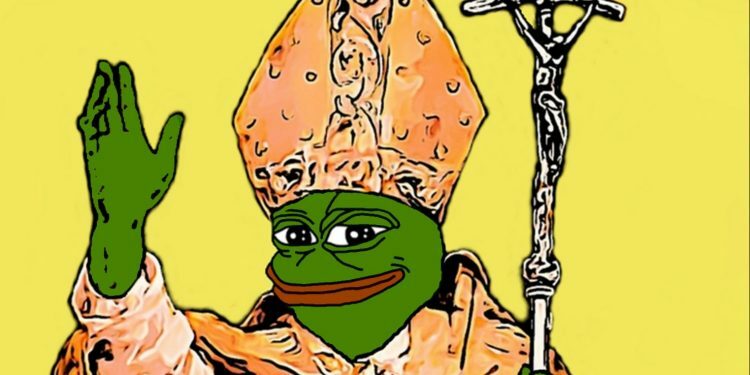 Certainly, there can be little doubt that the Bishop Pepe meme is “transformative.” Indeed, apart from both the symbolic value added to Furie’s simple line drawing by the anonymous meme armies on 4chan and the Alt-Right, not to mention the rise of Trumpism, the cover image of Bishop Pepe would be completely unintelligible. Clearly, Matt Furie and his lawyers failed to consider the significance of the fact that Dissident Dispatches is not a comic book. Despite superficial appearances, it has been recognized, not least by conservative Christians, as a serious scholarly work. Bishop Pepe symbolizes the transformation of both Alt-Right politics and the character of the Christian church advocated throughout Dissident Dispatches. Wilmer Hale is certainly aware that a fair use defence can be mounted against any lawsuit claiming copyright infringement. Their strategy depends upon the fact that potential defendants must consider whether they have the time and the money necessary to mount such a defence in a court of law. Often it is simply easier and cheaper to cave into a takedown notice issued under the Digital Millennium Copyright Act (DMCA). Individual defendants typically can be bullied into compliance with a DMCA takedown notice whenever the transaction costs entailed in defending a lawsuit from a copyright holder far outweigh any benefits derived from use of the copyrighted text or image. This is the prospect facing Arktos Media Ltd. Predictably, publishers prefer to pull the offending material rather than shoulder the burdens of litigation—even when the law, as in the case of Bishop Pepe, is clearly on the side of anyone making fair use of copyrighted material. But what if all Alt-Right users and fans of Pepe the Frog joined in a common crusade to free Pepe from the clutches of the ADL and Matt Furie? Why is it Worth Defending Bishop Pepe? Bishop Pepe provides an excellent example of the outright indifference of Wilmer Hale to the fair use issue. Nobody who takes a minute or two to examine the subtitle of the book together with the description of its contents on the back cover hold a genuine belief that Bishop Pepe’s purpose is to promote “alt-right ideology and white supremacy.” This accusation is simply boilerplate language cut-and-pasted from letters sent to the other Alt-Right recipients of takedown notices. But this case is not just about Bishop Pepe. There is no sign that any such fair use analysis was carried out in the case of either altright.com or Baked Alaska. Federal law provides that victims of “bad faith abuse can file a suit for money damages, costs and attorneys fees.” There is, therefore, a very real possibility that Alt-Right users of the Pepe meme targeted by Furie and his lawyers could mount a successful class action claiming damages for their bad-faith misrepresentation and tortious interference with contract. Such a lawsuit may even rise to the level of a religious duty. Perhaps Kyle Bristow’s Foundation for the Marketplace of Ideas should take carriage of such a suit as a concrete step towards uniting the Right in defence not just of freedom of speech but also of freedom of religion. It is not at all far-fetched to suggest that Bishop Pepe and other Alt-Right Pepe memes are religious symbols. Many observers, including the Southern Poverty Law Center, suggest that the Pepe meme reflects the inchoate, inarticulate spiritual needs driving the Alt-Right movement. Meme magic, it seems, may be more than a figure of speech. Everyone involved in this case should read and ponder The Truth About Pepe the Frog and the Cult of Kek. Many see the hand of Providence in the fact that Pepe the Frog came to be associated on 4chan with an ancient Egyptian deity known as Kuk or Kek taking the form of a man with a frog’s head. This ancient god was “a symbol of darkness, Kuk also represented obscurity and the unknown, and thus chaos. 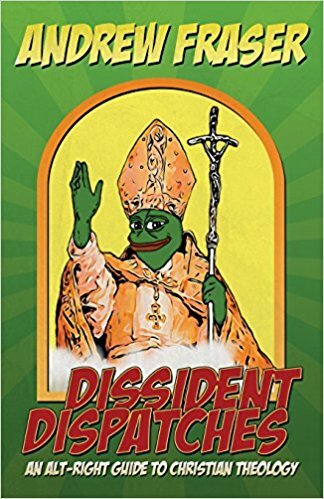 Also, Kuk was seen as that which occurred before light, thus was known as the bringer-in of light.” Note the rays of light emanating from Bishop Pepe on the cover of Dissident Dispatches, as well as the Trump-Pepe reminding us that it was always darkest before the Don. Pepe the Frog reveals in many ways that the Alt-Right is a religious as well as a political movement. Even Matt Furie once sensed something spiritual in the friendly frog meme. In a 2015 interview he reported a feeling of “complete joy in physically, emotionally, and spiritually serving Pepe and his friends through comics. Each comic is sacred.” Perhaps Pepe really is an archetypal emanation of the Ur-religion that Jordan Peterson associates with Genesis 1:-3. Perhaps, too, his appearance heralded the plague of frogs descending upon our postmodern pharaohs in New York and Washington. Surely the contemporary cult of Kek is merely kidding on the square as it draws upon the trinitarian theology of the early Christian church to celebrate the reappearance among us of Kek the Father, Pepe the Son, and Pek the Holy Spirit. In a grubby reprise of the original Passion play (with Matt Furie in the role of Judas Iscariot), the ADL may crucify Bishop Pepe. If so, I wonder whether Pepe will be reincarnated on the cover of Dissident Dispatches as Pek the Holy Ghost or, even better, Kek the Father? Or will Arktos simply step into the shoes of Pontius Pilate, washing its hands of the whole affair? Andrew Fraser studied law and history in both Canada and the United States before moving to Australia where he taught law for many years at Macquarie University. He was awarded a degree in theology this year and is the author of The WASP Question (London: Arktos, 2011). https://www.theoccidentalobserver.net/wp-content/uploads/2018/06/TOO-Full-Logo-660x156-1.png 0 0 Prof. Andrew Fraser https://www.theoccidentalobserver.net/wp-content/uploads/2018/06/TOO-Full-Logo-660x156-1.png Prof. Andrew Fraser2017-10-29 10:20:502017-10-29 10:20:50Who Owns Bishop Pepe?